A person with MS can ski and enjoy the mountains with family and friends! Ski 2 Freedom has many clients who have discovered the joys of the snow and magic of the mountains. Most ski schools which have qualified instructors for disabled and adaptive skiing and snow sports should be able to work with children and adults who have balance or mobility issues and conditions relating to MS. Your initial enquiry to the ski school should include as much background information on the skier as possible. If the skier has skied before, it can be incredibly useful to dig out old photographs or even video footage of them skiing previously to send to the ski school so that they can get a good idea of their level. Discussing in detail the skier’s specific needs and condition(s) is VITAL to ensure both the ski school and you know what is going to happen and to ensure you are matched with the right ski instructor and/or equipment. This may include a discussion about other associated health and social needs such as epilepsy, asthma, communication and social awareness skills and any recent medical developments. This is especially important in the case of MS as symptoms may vary hugely between two people with the same condition. Perhaps you are new to skiing or were a skier or snowboarder before being diagnosed with MS. Then there are lots of possibilities and we are delighted to discuss the options with you, please contact us. Many of the ski schools have a good idea of what is required especially when it comes to equipment and clothing, in particular the ski boots. Do ensure that you ask the ski school if they can recommend a ski hire shop for such items. 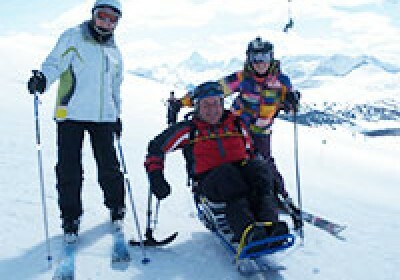 Whether special ski equipment is required will depend on the degree of the disability (i.e. whether there are mobility/balance issues etc. ), but fundamental to the experience will be a good knowledge and understanding of the skier’s needs so that a trusting relationship can be developed between instructor and pupil. Many ski schools are able to work confidently with you and will soon get you back on skis, skiing with the family perhaps in a sit-ski or Kart-ski ....... we are here to help you! "I returned from holiday with my sister last week and wanted to thank you for putting me in touch with Muriel at Loisirs Evasion. My sister really enjoyed the tandem ski and she was so excited. She was taken on black runs and enjoyed the thrill of skiing which she could never have undertaken before. She was excited from the moment she sat in the tandem ski and really enjoyed the lift too! She is busy saving for the next trip - the only downfall being the price which was 75 euros for two hours but she wouldn't have missed it for a moment. I can't thank you enough for making this sort of experience possible for her." “I have Multiple Sclerosis (Esclerose Multiple) and as a result have legs that are too weak to ski, I am able to walk about 500m with a stick. Before this diagnosis I was a confident skier and having been confined to a wheel chair, I have regained enough strength and balance to walk with a stick, I think it is time I tried to learn how to ski from a seated position. I was wondering if you could advise me of a good resort to visit where I could receive one on one tuition. I would particularly like to try between now and June, I was wondering if there was an appropriate resort with snow this late". Ski 2 Freedom advised on Val Thorens as this would be one of the few resorts still open and the client was only going for 4 days. Prosneige was the ski school chosen. "How we got on in La Plagne! We had a great time though Eve came out in spots (chickenpox!) on the plane! Luckily she didn't get too upset. We were in Plagne Villages and we much preferred the location to Plagne Centre which was where we stayed last year. The chalet was catered and great but not great for folks less mobile than I am - there were about 20steps up to the road (half with a little wall for balance, half with nothing) and meant we had to carry the pushchairs up to the road. Once we were up though, it was easy. We were about 50m from the telecabine to Plagne Centre so took 2 pushchairs down most days. At the top it is unmanned, and there is a turnstile which was a nightmare to get prams over (would be impossible in a wheelchair; too narrow) but we were told we could go through the exit barrier (no turnstile! )and get on through the exit door. After that we did this and it was much easier. The bottom end is fine as the platforms for getting on and off are linked (you can't get between them at the top end). We used our pushchair (an iCandy cherry) and one of the others (a Bugaboo chaemeleon) which ran pretty well on snow and ice (the Bugaboo was better) and a MacPac back carrier for 1 baby. Challenging but fun! We took Eve up on the cable car to Grand Rochette for the view and it was great-babies went free, Andy's ski pass covered him and I got a return trip for €8.You have to buy a ticket in the main shopping centre before you go; we tried to go a second time but the office shuts at 1530 and we were 10 minutes too late. They do discounts on lift passes for disabled skiers and I think also for helpers. Bobby has secondary progressive Multiple Sclerosis and took up skiing again with the help of the Rocky Mountain Adaptive Sports Centre (RMASC) which is based in Canmore, Alberta which enables children and adults with any physical, intellectual, cognitive, or developmental impairment to participate in all the fantastic sports and adventure activities that are available in the stunningly beautiful Bow Valley, including Canmore, Banff, Lake Louise and its surrounding areas. “Wow..Where to start! I am 58 years old and thought that because I had secondary progressive MS that Ski-ing was a closed sport to me (I have skied when I was young with family holidays at St. Moritz, Celerina and Riederalp and various excursions into Austria in search of snow) So when my daughter , Katie who was working the season in Banff, told me about RMASC and said that they were totally equipped to help less abled people onto the mountains, I jumped at the chance! Appointments and days were booked and we set of to Canada. The great day arrived and with some trepidation, We arrived at the base of the Gondola, to be met by a smiling Jamie with a welcoming "All-righte! ", a big smile and loads of infectious confidence, on the ride up we discussed my limitations and I was put at ease. The Sit Ski was explained to me and within minutes I was in it, (only to wipe out before I had even moved!!!) That started the first laugh of the day. Straight onto the magic carpet and the nursery slopes to get the feel of the chair then the big moment arrived and it was up the lift,( passed some strangely decorated trees) and out onto the slopes proper! A few gentle turns and then it was freedom (on the reins) and my whole life changed and I was hooked. With instructions from Jamie "Turn gently right....NO ..the Other right" followed by a spectacular wipeout!! all my fault but no bruises and then it was off again down the hill, practicing different turns and skills, all the time confidently under the control of Jamie.